This past year I had the privilege of working with 7 fabulous ladies who are such an inspiration to me, blogger/artists and dear friends as our journals traveled to South Carolina, Pennsylvannia, Arkansas, Three stops in the UK, Georgia and back home again. This was a true collaboration of inspiration, challenge, anticipation and sheer JOY! We all have decided to share the pages of our journals with you in hopes that they might inspire you to start your own group and share your journals with a circle of friends. 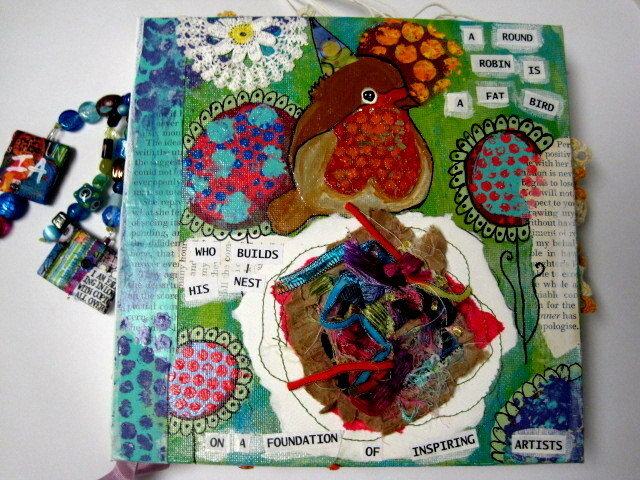 My Definition on my Journal Cover: "A Round Robin is a Fat Bird, who builds His Nest on a Foundation of Inspiring Artists." 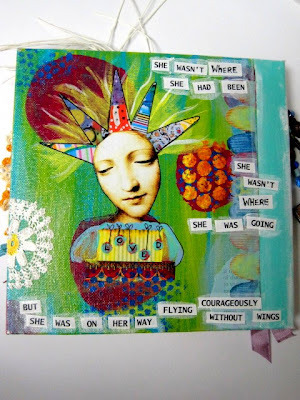 The back side of my Journal: "She wasn't where she had been, she wasn't where she was going, but she was flying courageously without wings." 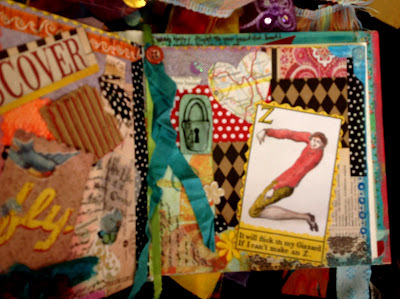 Most journals were open to any theme and each artist had the freedom to do whatever inspired them. It is our desire that our journey will inspire you. Please travel to each blog and leave a comment. Tell us what inspires you and what you love about Art Journals! 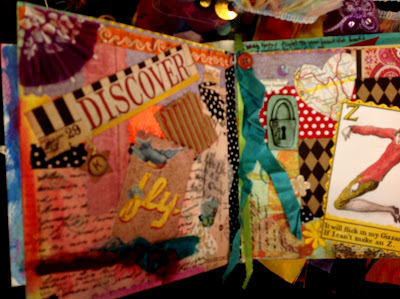 There is a JOURNAL PRIZE AND YUMMY GOODIES to be given away to the person most interested in starting your own Art Journal Group. All the details on Priti Lisa's blog. This time we will each select a combo of colors to be used in our books. I am going bold. I am calling on my "Inner Warrior" inspired by strong women, so I am using RED, PINK, and ORANGE, as dominant colors, infused with turquoise, gold, yellow, teal and other colors that give ReD, PiNk and OraNge their strength! Thank you for coming by! FLY COURAGEOUSLY! 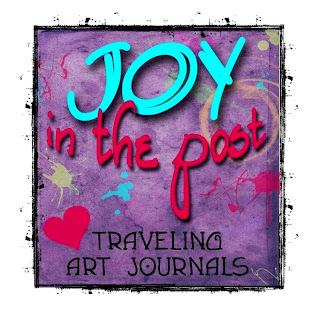 We hope to see YOUR own "JOY in The POST" this Year! I love this idea and you did such a wonderful job with your pages! Waving to you Lou Anne!! Thank you! It was a little intimidating at first, so many good artists. 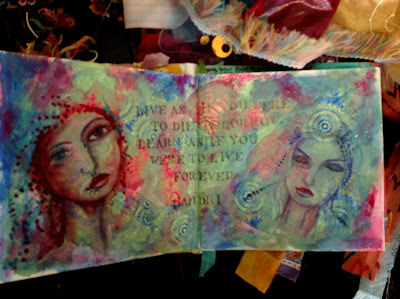 However, I am learning things about Art Journals and how much I love it and that it doesn't matter what you do as long as it is from your heart and it is uniquely you! It was great fun and friendships I will cherish forever! 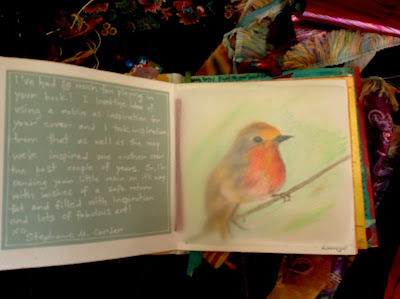 There's real JOY in these journals, and birds, and colour, and inspiration. It's such a great idea to collaborate in such a way. I have some friends I'd really like to do this with, just to keep some wonderful mementos of their work. I hope you will stay in touch, I would love to hear how it goes! I almost have no words to convey how powerful it is to see your book again here. Because I was the first to work in it, I only got to see your art and then mine in it. It was like Christmas each time I received a package from you with a new book to play in, and seeing all the pages together is like Christmas all over again. I love how the bird theme kept popping up in your journal, Kim :) These pages are delicious! What fun to see these this morning! 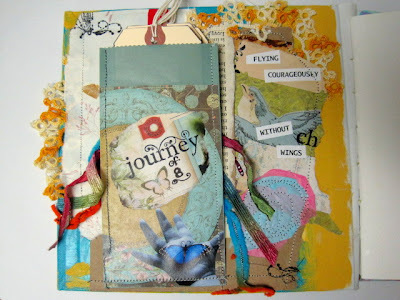 Thank you Priti onel I have already started on my next journal. pretty stoked about it! 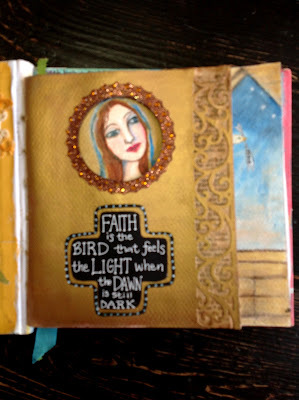 I love my journal and especially all the fabulous ladies who worked in it. I am also really loving the True Colors Book. 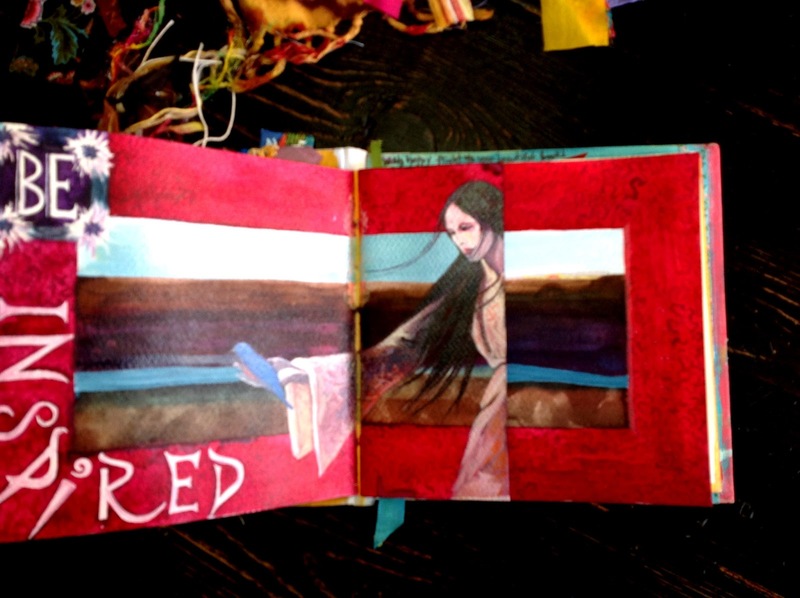 What a gorgeous spread of vibrant pages - so exciting to see them all together in this post. I'm loving this blog party, revisiting our amazing experience & feeling so happy & grateful to have been part of it! 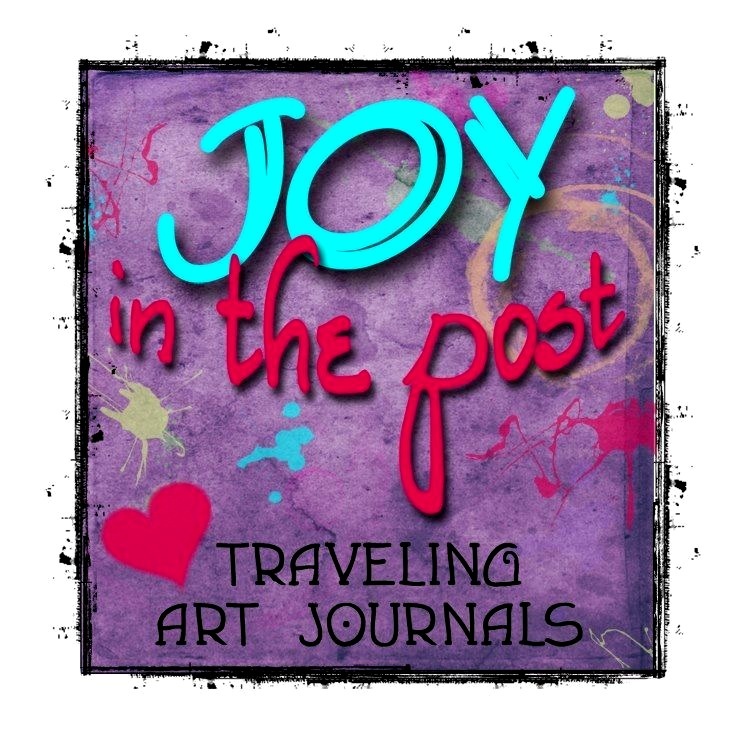 Happy "Joy in the Post" blog party to you! Sending you BIG party Hugs. Thank you Kat! Looking forward to our "Colour Journey" ! I loved seeing everyone's pages and pages I didn't get to see! So much talent in this group. I am trying to learn from everyone, you are all such an inspiration to me! Enjoying cake and party time... great day! Oh Kim such pleasure to see it all again. Kat and I have just been on the phone to share in our excitement!! I am so excited to begin our next journey together!! Oh Kim...LOVE this. Your cover page AWESOME! All of the artists work is fabulous. This is a treasure!!! Thank you Gemma, this has been such a joyful journey for sure! I am looking so forward with excitement bursting at the seams for our new adventure together! You can tell that all these women just open their hearts and the art flows out! So glad to have you aboard! These pages are all so dramatic and inspiring. It must be a real Joy to you. A wonderful way to collect examples of your talented friends' work. I often trade work with friends, but this way of collaborating. would be wonderful. The best way...it is a journal felt with the heart.. no words needed really. 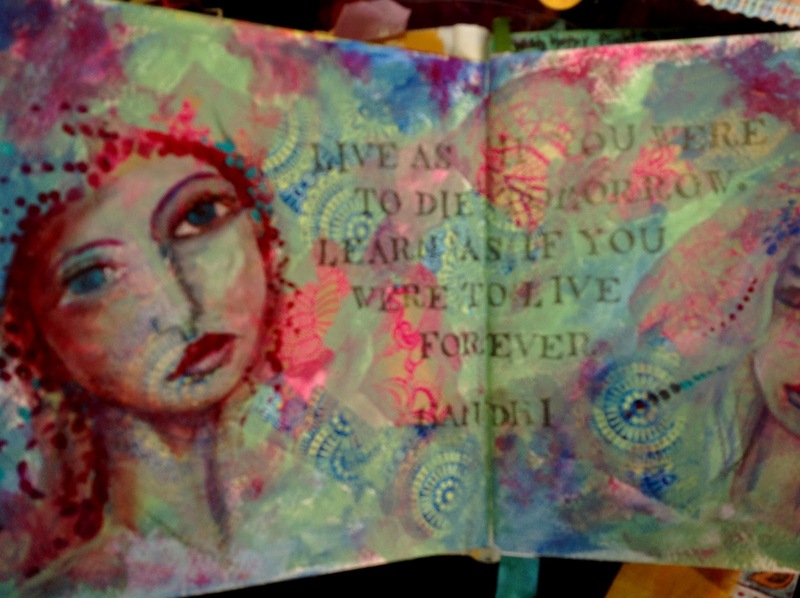 It means a lot to me to have my journals shared with my ART Hero's!! 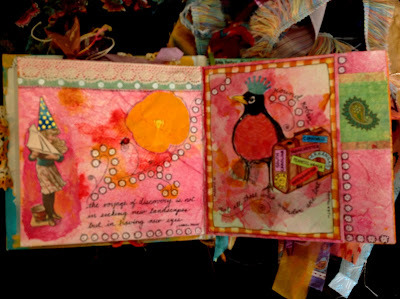 Lovely journal pages. 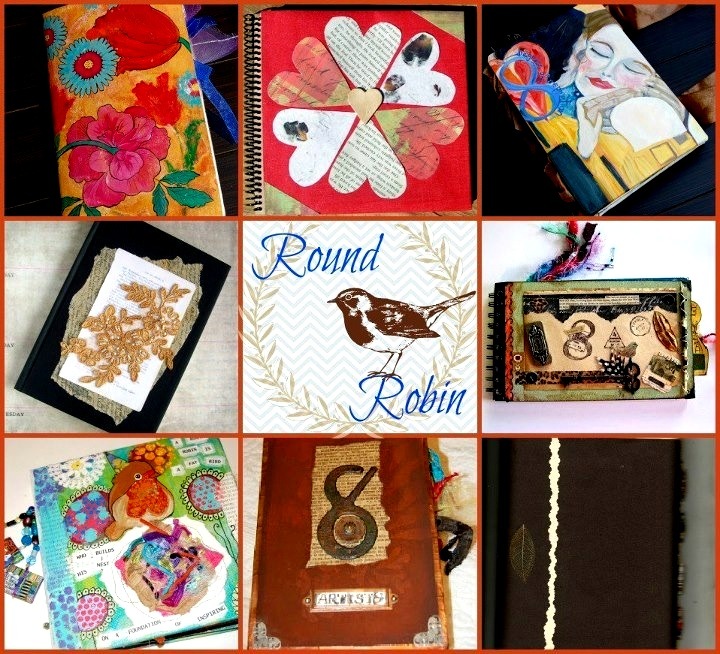 My sisters and I did a round robin journal last year and are going to do another one this year. It is really fun. I also belong to another journal group that did a round robin journal a couple years ago. It is a way to get inspiration and art from others. Deb, Thanks for stopping in. It's nice to have you here. I would love to see the work of your journals sometime. This was a great experience, one that I will always cherish! What a fun idea. Inspiring. I want to do this. 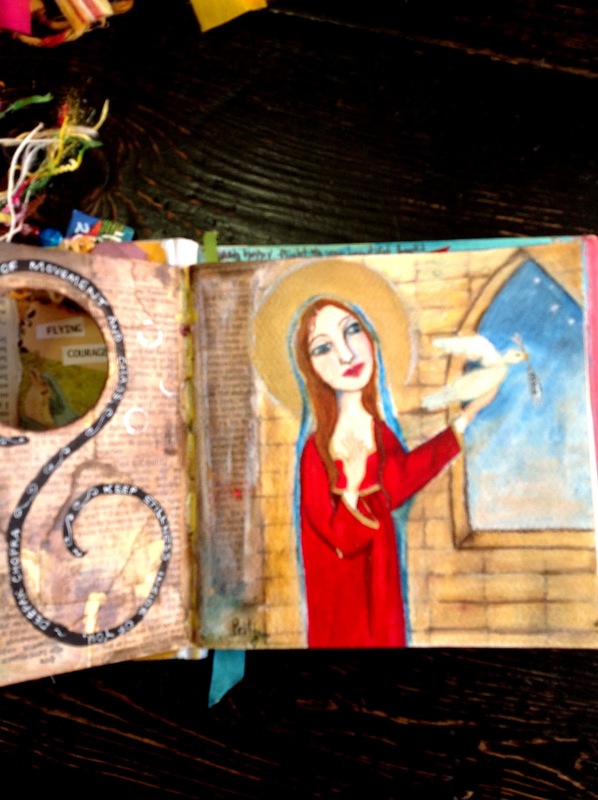 Do you journal on your own? If not, try your hand, it is incredibly addictive, a great outlet and a wonderful way to share your art, feelings and inspiration with other friends and artists! It's a new year, put it on your list of things you WILL DO! 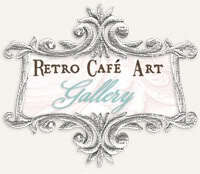 Feel free to stop in anytime and share your art! How awesome is this birdie book ?!?! Wow ! I love how art journaling lets all artists have a voice in their own style, and how in the end, we ened up with these incredible documents that share a piece of ourselves ! Great job, Ladies ! Thank you for stopping in Kim, this was a incredible experience. We are about to embark on it again and this time it will be about color combo's for each journal. Excited!! 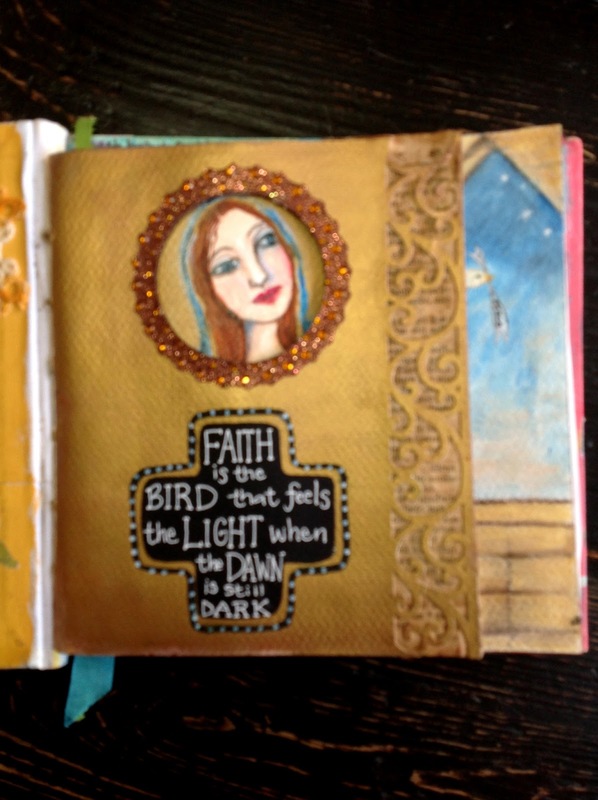 Each of these journals is gorgeous...and such a treasure to keep. I reckon I could gather some of my Aussie artist friends to participate in a similar project. 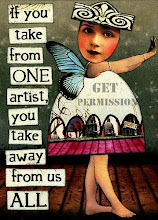 It's a wonderful way to collect others art. Such gorgeous pages! I just finally was able to load mine. My camera was being wonky and wouldn't shoot anything. Anyway, I am so happy that we are going to do this again! Whoot! Me too! I am working on my journal this week. I think this one will to the moon and back! Excited! 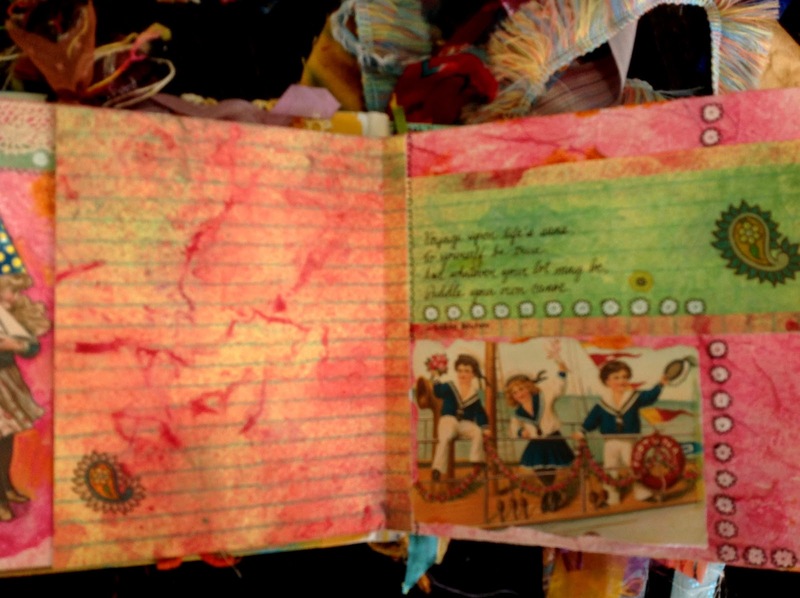 What yummy pages in your journal, Kim! Thanks for sharing this with us. Thank you for stopping in and commenting. I will be sharing our next project as well and it will be really cool. 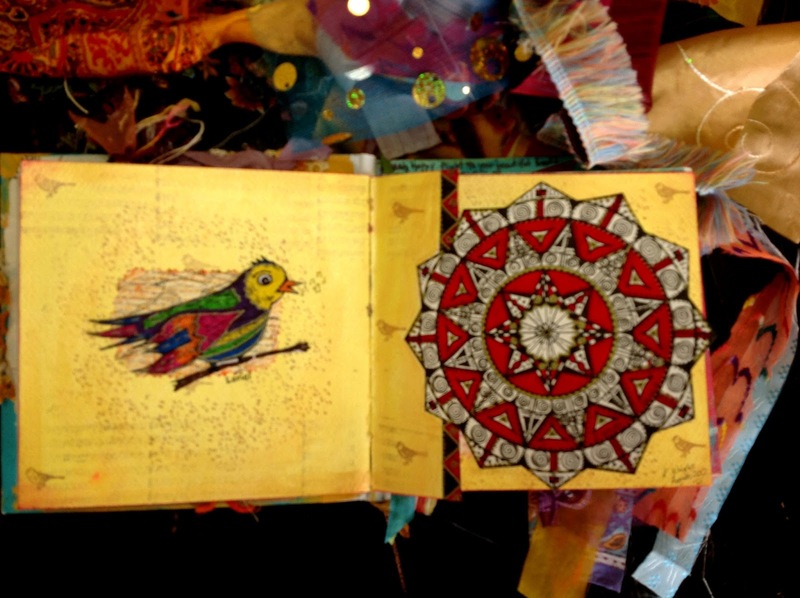 Your journal turned out spectacularly well! It was so great to watch this round robin in action - it seemed to flow so well. Thank you Eva, it was great fun with a group I love and a journal I will treasure! We are beginning a new one March 1st. gosh, y'all had a fine ole time and the results are Wonderful! Yep, I will visit the other women and see the work of their hands and heart. I'm a tad envious but you've given me a fabulous idea for a shared art project with my Beloved Best Friend...my BBF...thanks! I love that you stopped by! You should definitely do it. I have actually done one with a long distance friend and we shared recipes, photos, moments of our days , sending back and forth the journals, at the end of each month we would switch. Another journey with a friend sharing our year together. It was fabulous! If you do it, I would love to hear about it! Hugs to you my farm friend! Hi again Kim. After visiting everyone, I had to return to your post. I love your covers-front and back. Your work is so vibrant and free. This was such a special project for a talented group of artists. I could recognize your work in each journal and loved the way you created something uniquely about the recipient. I hope I can do something like this! I love your work Lou Anne, you can so do this! Thank you for your sweet comments, and for stopping in. 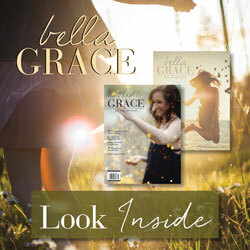 We are doing another one in March, I would love for you to come back and take a peek! Hugs to you my fabulous friend! Great blog. And I absolutely love the Round Robin Art Journal. 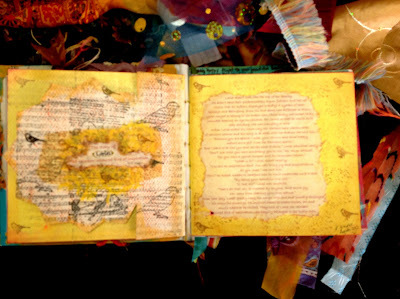 It must have been so exciting to receive your own book back with all the new pages so beautifully decorated. It is nice to see a collaboration of like minded individuals create something so special and unique. 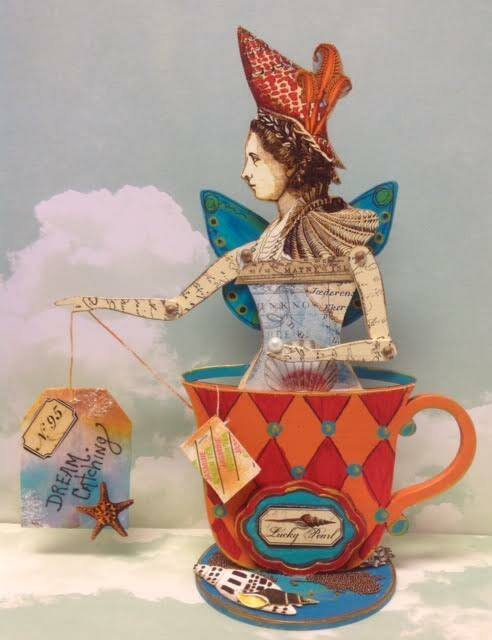 I will put this idea into the minds and souls of the talented chics in our Arty Tea Party Guild. It's the perfect time for a project like this. It is sure to beat away the winter blues. I am off to visit the rest of your talented friends! Thank you all for sharing your books and beautiful pages. It truly is an inspiration! Thank you Vicki for your kind words and for stopping in. I hope our journey has indeed inspired you to start a group of your own. 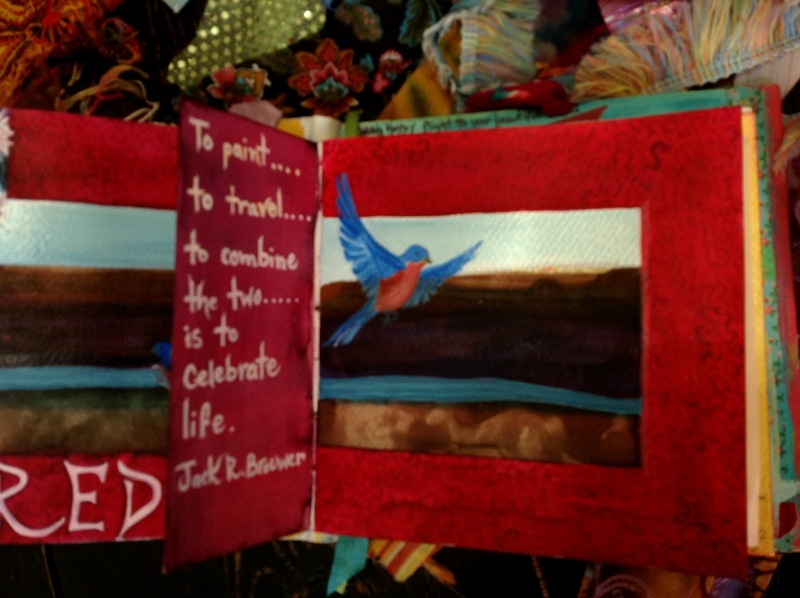 It is a wonderful experience with a group of friends and artists and really taps into your inner creativity! 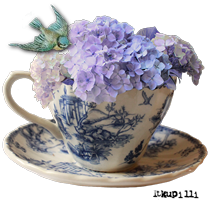 We are starting a new one in March, you are welcome to drop in anytime and take a peek at our progress and shared pages as we go!